The Bradenton-Sarasota area is blessed with beautiful white sand beaches, lush tropical gardens, outdoor adventure, and delicious dining. If your weeks are jam packed and you find yourself wishing for a weekend of rest, relaxation, and a bit of excitement, consider taking a weekend trip to one of the area’s best romantic getaways! 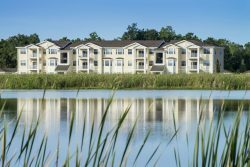 Grab your sun hat and luggage as Forest Properties highlights some of the best romantic travel accommodations and activities near our Florida apartments. Lido Beach Resort – As a local favorite that has earned the reputation of the most romantic resort in Sarasota, we naturally had to list Lido Beach Resort as our first choice for couples! This beachfront location is surrounded by white sand beaches, swaying palm trees, and tranquil waters of the Gulf of Mexico – creating the perfect paradise for couples to escape to. In addition to guest rooms to junior suites accommodations, Lido Beach offers private beachside cabanas and a fresh Sunday brunch for guests. Plus, with three on-site eateries, the Tiki Bar, Cafe Lido, and the Lido Grille Bar, you wont need to go far for a fresh and delicious meal! The Resort at Longboat Key Club – This Four-Diamond resort is perfectly tucked away at the southern end of a barrier island in Sarasota – creating the perfect escape for a romantic beach weekend. Longboat Key Club offers designed romance packages for couples in need of rest and relaxation in a beautiful atmosphere. This one night accommodation offer includes sparkling wine and fresh strawberries, daily lunch (up to $25 per guest), dinner per guest (up to $90), and complimentary late check out. Don’t forget to reserve a spa service or additional outdoor activity to make the most of your stay! The Sarasota Ritz-Carlton – If you’re in the mood to splurge for the weekend, or are looking to celebrate a special anniversary milestone or birthday, The Sarasota Ritz-Carlton is one of the area’s most luxurious choices. Perfectly places in Downtown Sarasota gives guests the ability to explore the area’s vibrant nightlife, extensive shopping, and variety of local eateries. Plus, being a Ritz-Carlton resort, the top-notch amenities will make you feel like royalty for the weekend. Switch up your dinner plans and enjoy the iconic sunsets of the Gulf! LeBarge Tropical Cruises, a local landmark for 30 years, gives cruisers a front row seat to the best sunsets in Florida while enjoying a tropical cocktail or bite to eat from their light fare menu. For daytime entertainment, they also offer dolphin and manatee cruises. If shopping ‘till you drop is your type of vacation activity, you can’t pass up visiting St. Armand’s Circle! The Circle is a charming and graceful mix of Florida’s finest shopping, unique dining, and relaxing spa accommodations. Before you plan your trip, stay up to date on their event calendar to ensure a memorable visit! Jungle experiences take on a whole new meaning at the Sarasota Jungle Garden! Known as the area’s favorite family attraction, there are quite a few exhibits that you and your partner can enjoy together. Our top picks are the butterfly gardens, flamingo feeding area, and relaxing koi ponds. 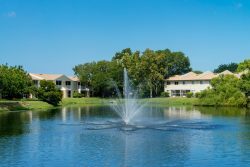 Explore Ranch Lake's luxury community in the heart of Bradenton, Florida. Whether you’re a full time resident of the Sarasota-Bradenton area, or are looking to plan a romantic weekend getaway, the above attractions perfectly compliment Florida living with relaxation, rejuvenation, and exploration! Where are your favorite places to escape to in the area? Share your spots with us on Facebook!